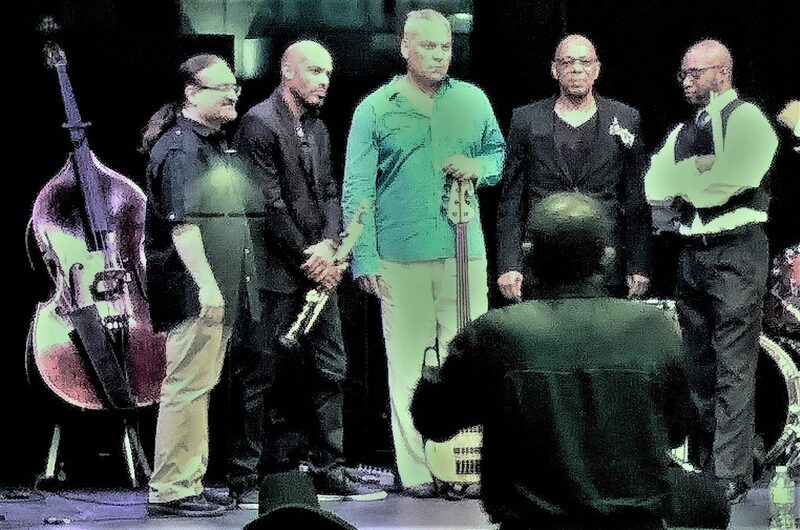 It’s been 35 years since Miami-based percussionist Bobby Thomas Jr. last performed with iconic jazz/fusion band Weather Report, but the influence was still evident when Thomas appeared Saturday night at the Arts Garage in Delray Beach with his group The 7th Realm. The otherwise ageless 62-year-old percussionist showcased tunes by former Weather Report bandmates Wayne Shorter, Joe Zawinul and Jaco Pastorius, as well as compositions by Billy Strayhorn, Chick Corea, Charlie Hayden, Brian Blades and Woody Shaw, plus improvisational material, for an appreciative three-quarter-capacity audience. And Thomas’ versatile quintet, with saxophonist/flutist Fernando Diez, keyboardist Abel Pabon, bassist and musical director James McCoy, and drummer Jermane Dukes proved more than up to all inherent challenges. Shorter’s Weather Report tune “Palladium” opened the proceedings with a bang, as McCoy nimbly executed Pastorius’ difficult lines on electric fretless bass amid Pabon’s synthesizers and the rhythmic fuselage of Dukes’ drums and Thomas’ congas, bongos and cymbals. The percussionist would play additional toys — all by hand rather than with sticks — as the opening 45-minute set continued. Diez’s tenor saxophone was buried in the mix on that opening number, but his flute on the subsequent Strayhorn tune “Chelsea Bridge” was audible and articulate. McCoy switched to an acoustic upright bass in a back-and-forth that continued throughout the night, and his swing feel provided a rudder through to the end, when Thomas creatively added parts on mounted Asian bells. Corea’s “Armando’s Rumba” again featured Diez on flute, and the piece’s accelerated Latin feel upped the energy level. Dukes alternated between a pattern that included playing the rim of his snare drum with both sticks and a traditional ride cymbal feel; Pabon performed a wild piano solo that showcased Corea’s estimable influence, and McCoy, again on electric fretless, took a banner break while accompanied by the drummer and Thomas (on a hand-held shaker). For Hayden’s ballad “Spanish Love,” Diaz switched to sax; Dukes to brushes, and McCoy to upright (complete with a bowed ending) to accentuate Pabon’s piano and Thomas’ unique combinations of congas and bongos. Blades’ slow, 6/8-timed “Stoner Hill,” one of the evening’s most modern covers, likewise proved a pleasant surprise, mainly through Pabon’s atmospheric piano. To close the set, Thomas went even more modern with a funky group improvisation called “7th Realm.” Diez opened the proceedings as a vocal beat box before switching to sax to accent McCoy’s fretless bass and Pabon’s synths. The bassist then anchored the inside-out, 4/4-timed groove as Thomas and Dukes each took memorable solos over the other musicians’ collective vamp. Mission again accomplished during the 40-minute second set, an exclusive collection of highlights. Thomas opened solo on the Hang drum, the Swiss instrument that looks like a cross between a flying saucer and a barbecue grill, by playing steel drum-like tones with his ever-dazzling hand speed. McCoy then took center stage on fretless to offer a lesson in harmonics before segueing into Pastorius’ “Continuum,” a duet with Pabon in which both musicians displayed ample listening capacity as well as soloing technique. An unaccompanied Dukes took the spotlight next, displaying muscular footwork as he covered swing, funk and rock feels while soloing with both his hands and drum sticks on his kit. Shaw’s “Katrina Ballerina” was the first of four closing compositions, and the 6/8-timed swing feel by Diez (on sax), McCoy (on upright) and Pabon (on piano) set up banner traded solos between Dukes and Thomas. The percussionist then took the microphone to introduce “A Remark You Made” by Zawinul (1932-2007), the mentor and friend with whom he also played in the post-Weather Report acts Weather Update and the Zawinul Syndicate. Weather Report’s greatness was due, in part, to its ability to fuse modernism with traditional jazz influences. And this quintet oozed that sentiment on the Zawinul ballad, as Thomas played an introduction on his Korg drum synthesizer that led to beautiful fretless playing by McCoy. Pabon and Diez echoed Zawinul and Shorter with their synth and sax work, respectively, and Dukes (with brushes) and Thomas played with just the requisite minimalism. Pastorius’ “Three Views of a Secret” proved another slower number, this one in waltz time, that nonetheless found ways to up the room’s energy level. Diez switched from tenor to soprano sax midway through piece to suit McCoy’s fretless lines and Pabon’s synth tones as Thomas added furious conga-and-bongo combination fills. Another funky vehicle, the piece was guided by Dukes’ punishing footwork and Pabon’s combination of synth and clavinet sounds, which showed the influence of not only Zawinul but also Corea, Herbie Hancock and Stevie Wonder. The improvisational closer proved an exclamation point for an evening by a band set to go into the studio for the first time. Freed up after nearly 40 busy years playing with pianist Monty Alexander, Thomas has clearly assembled the right unit for recording. On this night, it could’ve made an outstanding live album.